Historically hard metals would need to be installed onto a vented timber as shown below. 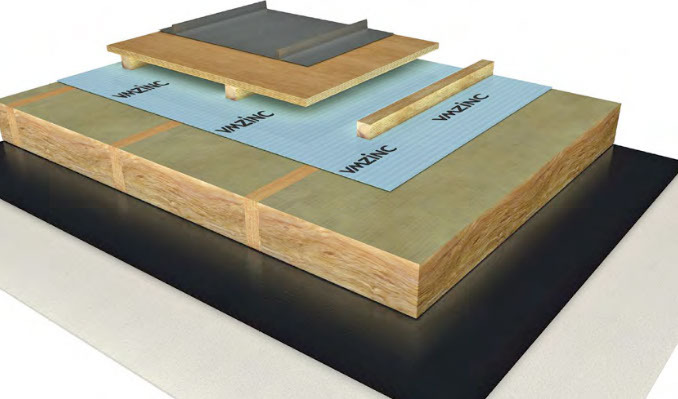 Modern methods use rigid insulation boards with WARMFAST® Fixings to remove the vented void and need for costly timbers. The WARMFAST® System reduces the roof height giving a more compact and cost effective build up. 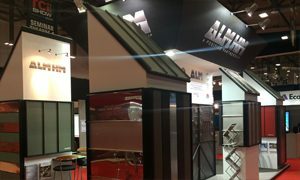 Providing the rigid insulation used meets the requirements set by the outer skin manufacturer (Kingspan TR26 or Equal is normally used, also available through ALM HM), our WARMFAST® fixing system removes the requirement for fixing standing seam metal roofing directly onto a vented outer skin of plywood or other timbers. Currently warm roofing is by far the most popular when specifying hard metal roofing as by removing the 18/22mm timber layer and the 40/50mm ventilation, the architect or building owner gains an extra 60mm/70 minimum extra interior height. Rigid insulation, WARMFAST® fixings and vapour barrier can also be used for curved warm roofing where composite panels and other types of warm roof build ups cannot. Below is a typical build-up example where WARMFAST® fixings would be used, showing Trapezoidal deck. Plywood is often used depending on the purpose of the building and complexity of the roof. Due to the potential build-up of condensation on its underside, Building Control does not accept non vented ply directly over insulation unless the ply is fully factory bonded to the insulation board. 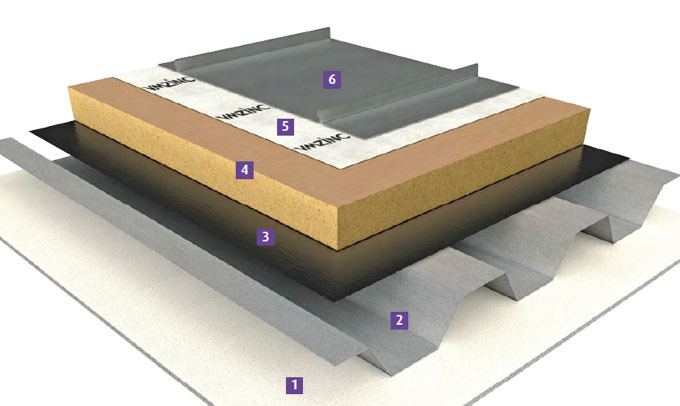 With WARMFAST® this outer timber layer and/or requirement for a vented void is completely removed. The removal of ply also helps with carbon calcs. For exceptional curved metal roofing, Linitherm PGV Flex is recommended using WARMFAST® fixings and Vapour Barrier. PGV Flex is an insulation board rigid enough to take foot traffic with metal installed, yet flexible enough for barrel vault roofing to tight radii. PGV Flex gives the best aesthetic finish to curved metal roofing by preventing the appearance of faceted off cuts becoming visible through the surface of the metal, as seen with pure rigid board. WARMFAST® fixings consist of a stainless steel weight/pressure distribution plate. These are available with both fixed and sliding elements. The plate has metal teeth to its underside that are pushed into the insulation to provide grip. A synthetic peg (available in various lengths from 30mm to 700mm to cope with all thicknesses of insulation) is then inserted through the plate, and through the insulation. The fixing screw (again available in various lengths) then sinks to the bottom of the peg, goes through the small remaining depth of insulation, through the WARMFAST® Vapour Barrier and into the deck, compacting the build-up tightly to the building. With the roof being cold and the insulation is warm – a metal connection between the two would be a cold bridge. This is where the fixing sweats as the cold from the outer skin and the warmth from the interior meet. With WARMFAST® the fixing screw sits deep within the synthetic peg, completely isolated from the metal outer skin and metal fixing plate. By completely isolating the fixing from contact with other metals connected to the metal roof, the potential for “cold” bridging is severely reduced. WARMFAST® Vapour Barrier is foil faced with a self-adhesive underside. Furthermore it has a reinforced mesh that prevents tearing at fixed points and a bitumen centre that self-seals around all fixed points ensuring vapour control is not compromised. WARMFAST® Vapour Barrier is recommended for all types of roofing build up, but is most known for metal roofing and should always be used where WARMFAST® Fixings have been specified. Benefits of the WARMFAST® build up method such as extra roof height, lower carbon ratings etc relate to architects/building designers, not necessarily the installer. This said however, using the WARMFAST® build up is quicker and cheaper for the overall build than having to install raised battens above deck to create a vented void, then 18mm wbp plywood, then separate fixed and sliding clips. WARMFAST® is becoming a highly specified option for the vast range of metal roofing materials avaiable. WARMFAST® fixings and Warmfast Vapour Barrier are available only from ALM HM.